The U.S. Environmental Protection Agency bestowed on Oct. 10 a 2018 Green Power Leadership Award on the University of California. The UC system was one of the five organizations that won the award in the category of direct project engagement. The category recognizes organizations’ long-term commitment to green power through on- and off-site self-generation and physical power purchase projects. The EPA defines green power as electricity that is generated from environmentally friendly sources such as wind, solar, and biogas, to name a few. According to the EPA, the UC system’s current green power use of almost 183 million kilowatt-hours is enough to power almost 17,000 average American homes annually. In addition, there is an increase in the amount compared to the use of 128 million kilowatt-hours in 2017. The EPA lists the UC system fourth among its top 30 green power partners in higher education. This marks the second year in a row that the UC system has won the nationwide Green Power Leadership Award. UC President Janet Napolitano was also named the 2018 Green Power Leader of the Year for her leading support in renewable energy. Back in Nov 2013, Napolitano announced the Carbon Neutrality Initiative, committing the UC system to generating net-zero greenhouse gas from its campus buildings and vehicle fleet in the future. During the 2018 award ceremony, Napolitano re-emphasized the goal of the initiative. At UC San Diego, a series of sustainable practices has been made throughout the years. The university aims to decrease the release of carbon dioxide in the areas of transportation, energy production, and waste reduction. Examples include, but are not limited to, replacing the campus fleet with over 60 percent alternative fuel vehicles and increasing bicycle access through the campus bikeshare program, Spin. 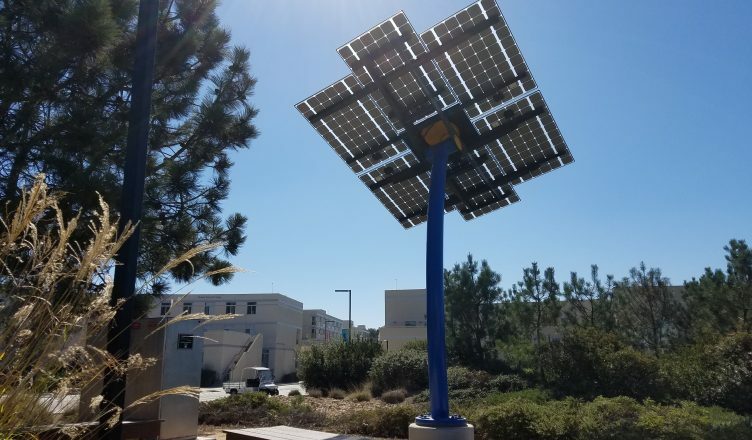 Notably, the “solar chill,” a charging station powered completely by solar energy located near The Village at Torrey Pines and across from the Rady School of Management, was built by undergraduate students from the Jacobs School of Engineering. The award also comes one month after the UC Office of the President announced a commitment to use 100-percent renewable energy across all 10 UC campuses before 2025.